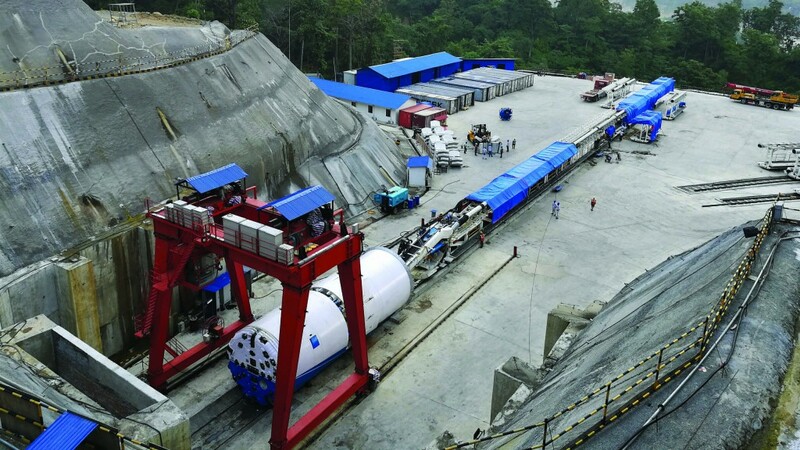 A 5.06-m (16.6-foot) Robbins Double Shield TBM has bored over 1,000 m (3,280 feet) in one month at Nepal’s Bheri Babai Diversion Multipurpose Project (BBDMP). The decision to use a TBM for the BBDMP project – designated by the government as one of Nepal's 11 National Pride Projects – was a departure for a nation where drill & blast has long been the preferred tunnelling method. Early studies done on the tunnel path predicted that drill & blast excavation of the 12.2-km (7.5-mile) tunnel would take close to 12 years to complete. The tunnel is located in the Siwalik Range, part of the Southern Himalayan Mountains, where geology consists of mainly sandstone, mudstone and conglomerate. Mr. Wang Wu Shui, general manager for COVEC Nepal, cited several factors that have contributed to the good advance rates so far. "In China, there is a saying about TBM construction: ‘geology is the premise, equipment is the foundation, and talents are the key.' The great advance rates achieved at present mainly lie in preliminary planning, process control, and professional construction personnel." Shui added that technical training and guidance are provided for each position so that all personnel can fully understand their job and team responsibilities. If unforeseen circumstances arise and there is no operator for a certain position, others have enough training to fill the role. COVEC Nepal are prepared for the conditions and have worked out efficient tunnelling logistics to decrease downtime. "The two working procedures of tunnelling and segment erection are carried out simultaneously under the double shield tunnelling mode, and the time to erect a ring of segments is 15 minutes in general," said Shui. "Under the single shield tunnelling mode, segment erection comes after tunnelling in a sequential process, but the segment erection time is still about 15 minutes." To further reduce time, consolidation grouting is carried out in advance during daily maintenance to avoid the impact of downtime for grouting on the overall construction progress. Once complete, the BBDMP will irrigate 60,000 hectares of land in the southern region of Nepal, and benefit an estimated 30,000 households. It will divert 40 cubic metres (1,400 cubic feet) of water per second from Bheri River to Babai River under a head of 150 m (490 feet) using a 15-m-tall (49-foot) dam, providing year-round irrigation in the surrounding Banke and Bardia districts. The water will also be used for hydroelectricity, with a generating capacity of 48 MW benefiting the country with NPR 2 billion (20 million USD) annually. The initial success of the TBM operation has already inspired developers and contractors to opt for TBMs over conventional excavation methods on upcoming Nepalese tunnels. The COVEC Nepal crew celebrate the record-setting month of over 1,000 m (3,280 feet) for the Robbins Double Shield TBM boring the BBDMP tunnel. An overhead view of the BBDMP jobsite, located in Bardia Wildlife Reserve, a sanctuary home to tigers, rhinos, elephants and many other types of vulnerable flora and fauna. Launched in summer 2017, the Robbins TBM is the first ever to operate in Nepal and has garnered much national attention for its successful operation.